Diona Joyce has pluck. Twelve years ago, she arrived in Toronto as a lone immigrant with no job prospects. She only knew one person in the city—a friend from Manila who, after a year, she would lose to cancer. Today, Joyce is on a mission to put Filipino cuisine on Canada’s culinary map, and she is gaining momentum. Joyce, 36, is the chef/owner of Tita Flips, a successful catering company whose clientele extends beyond Toronto’s growing Filipino community. But she is better known these days as the woman behind Kanto, which specializes in Filipino street food. Kanto is one of 11 vendors that operate out of refurbished shipping containers at Dundas and Bathurst Streets, in downtown Toronto. This once lonely and drab strip, which is part of Scadding Court Community Centre, has been transformed into “Market 707,” an exciting mecca for foodies who come for the delightful array of international food ranging from North African merguez sausages to South American ceviche. The waiting list for vendors--who must comply with Toronto Public Health guidelines--has grown longer since the stalls opened a few years ago. It has become “a hot piece of culinary real estate,” according to the popular local food blog, Blog T.O. Now on its first year of business, Kanto has generated the most buzz from the city’s mainstream media, food bloggers and social media. Last June, the city’s premier magazine Toronto Life picked Kanto as “lunch pick of the week.” CBC’s popular host and food columnist Sarah Elton has featured Joyce on her program. Word has gotten around so fast that in the summertime, when the strip is at its busiest, Joyce says she and her mother Catalina Libunao are on their feet all day. Kanto favorites include “sisig with fries,” palabok (noodles), lechon kawali (deep-fried pork belly), tapsilog (jerked beef, fried rice and fried egg), puto (rice cake) and halo-halo (shaved ice over fruit in syrup). They are traditional Filipino dishes that Joyce says she’s given “a new twist,” which she describes as “leaving the integrity of the dish” but adding elements that would appeal to the North American palate. 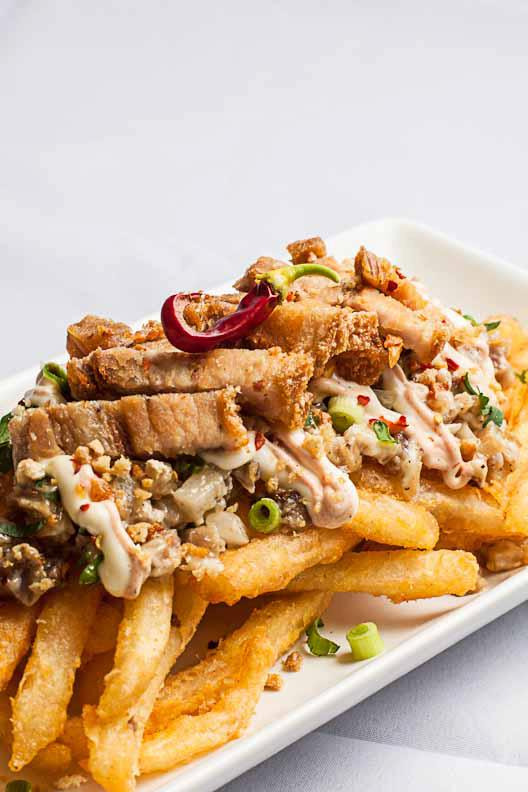 The idea for sisig with fries came to Joyce in a pinch. Dismayed that she and other Filipino vendors had identical menus at the city’s Waterfront Night Market event, Joyce tried to figure out how she could be different. She figured that on its own, sisig, a popular sizzling appetizer in the Philippines, might be a tough sell to the uninitiated, even if the pig’s ears and snout have been boiled, grilled and chopped into unrecognizable pieces and marinated in lemon, vinegar, onions and seasoned with spices. Hot and crispy fries, however, are many a dieter’s kryptonite. Joyce experimented by topping fries with garlic lemon aioli, chopped green onions, sisig, and lechon kawali. When Kanto opened, some Filipinos warned Joyce that her business wouldn’t fly; others cautioned her against selling dinuguan (pork blood stew). The thing about Joyce, however, is that when naysayers say it’s impossible, she gets energized. “I said to them. You think only Filipinos will eat dinuguan? Watch me.” She proved them wrong. These days, dish by dish, Joyce has been trying to prove that Filipino food is as tasty and as exciting as Thai and Vietnamese cuisine, which are more popular among Torontonians. Overall, Filipino cuisine has had a bad rap among Canadians--it’s been called Thai food’s “ugly sister” and is viewed as nothing but fried, fatty and drab food. But Joyce insists, “We have a lot of awesome food.” And so, even if Kanto is selling street food, it’s “elevated street food,” and she makes it a point to “plate” her dishes properly even if they go into a container. “We don’t just slap it in a container even if it’s street food,” she says. “Aside from taste, food is also a matter of presentation.” The hot dishes are also cooked on the spot and not simply reheated in a microwave. The chicharon (pork cracklings) that are ground and used as a topping for her pancit palabok are from her kitchen, not store-bought. Joyce has also made it a point to introduce Filipino cuisine even when she is catering a non-Filipino event. Her “halo-halo bar” has become popular in weddings and debutante balls. But what also sets her apart from other Filipino food entrepreneurs in the city is her deft use of social media and marketing. Kanto and Tita Flips are active on Facebook and Twitter and have their own dedicated websites, where Joyce posts Instagrams of her latest concoctions. Once, she had a hankering for suman (sweet sticky rice or cassava in banana leaf) and decided to make some for herself. As soon as she posted a photo, she received tweets and text messages asking her if they were available for pick-up at Kanto. Joyce has her pulse on the food scene. In 2011 she was one of the vendors who got chosen for the inaugural launch of the Toronto Underground Market, a social food event that attracts urban foodies. “Diona Joyce’s ukoys—shrimp fritters with pumpkin squash, corn and sprouts—were selling faster than she could fry them up,” noted Toronto Life. Joyce says she gets plenty of help in product branding and marketing from her husband, who owns a design and marketing company. The name Kanto, comes from the Tagalog word for corner, but Joyce says it’s also the combination of “kain” (eat) and “T.O.” (short for Toronto, Ontario). Tita Flips, is from Tita (either a term of endearment or respect for someone older, like an aunt) and flip (slang used to refer to those of Filipino descent in North America.) The Tita Flips logo features a young, slim, brown woman with magenta-colored lips and brown-black flowing hair, dressed in a powder-blue dress and neon green oven mitts. She exudes grace and competence; she could be your aunt, but a hipster aunt. She inherited the cooking, hard work and entrepreneurial spirit from her mother. “She’s the original Tita Flips,” says Joyce. As a little girl she would watch and help her mother make peanut products (skinless adobong mani (garlic peanuts), and peanut brittle) in Oroquieta City, northern Mindanao. Diona’s Peanut Products became a popular pasalubong (gift) and were so good that former Philippine president Joseph Estrada had them delivered every week even when he was under house arrest. Her mother also managed a banquet hall owned by a relative, and Joyce remembers watching her and Nanay Suping, a kitchen staff cook, prepare food for hundreds of guests. “I saw them cooking all the time. I would watch in the kitchen, instead of playing, and it (cooking) became second nature to me,” says Joyce. Joyce did not make a career out of it right away, however. She graduated with a degree in commerce and marketing and became a successful medical representative in Manila. Her popularity may have been aided by the fact that she gave away Diona’s Peanut Products as gifts, she admits. “It was like a niche market. Doctors would also order them even though mahal ang mani ng nanay ko (my mother’s peanuts were expensive),” she laughs. Upon arriving in Toronto, Joyce found out that her friend had been afflicted with cancer a year after being in Canada. She was not only alone and very sick in a damp basement room, but her Filipino landlord was evicting her. Joyce found an apartment and took her friend in. She also had to find a job right away because she was her family’s breadwinner back in the Philippines. It was the same steely determination that gave birth to Tita Flips in 2008. The process for sponsoring her parents was taking too long, and her father was getting impatient. She decided to invite them on a visitor’s visa, and when they came, a lawyer suggested that a work visa might speed things up. Her mother could work for a restaurant since she had cooking skills. Joyce decided to set up her own food business and has never looked back. Marites N. Sison is a journalist based in Toronto. You can follow her on Twitter @maritesnsison. 1. Place pork belly in a bit pot with water. Bring to a boil. 2. Season with salt and pepper to taste. Add bay leaf. 3. Simmer pork until fork tender. 4. Remove meat from pot and let it cool down. 5. Deep fry the belly in 300C for 30 minutes. Be careful as oil splatters everywhere so make sure you cover the pot or deep fryer. Skin should be golden brown in color. 6. Remove from fryer and cool completely. When cooled down, store in the fridge for at least 12 hours. This will help create a crispy skin. 7. Fry pork belly in 375˚C oil until skin becomes crispy. 8. Slice into desired serving portions and serve with lechon sauce. A Filipino in the NBA? Why Not?